Today on Saturday, 03-June-2017, at 7.07 am morning I received an SMS which was quite shocking. Good morning Sir, I am from Telangana. 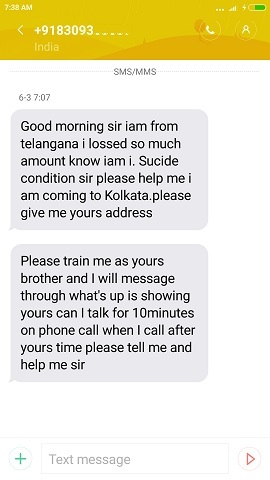 I lost so much amount know, I am in Suicide condition sir please help me, I am coming to Kolkata. Please give me your address. Please train me as yours brother and I will message through what’s up is showing yours, can I talk for 10 minutes on phone call when I call after yours time please tell me and help me sir. Imagine seeing this first message as soon as you get up on your phone. Speaking English like well educated person, but giving an excuse to save 4000. Obviously I said, “No rules is same for all, when you sell vegetables to a poor man, do you give him 80% discount?” He kept down the phone. But this morning SMS was shocking. Not even once he said he will pay the course fee, but he is willing to come to Kolkata from Telangana and learn personally from me. This guy has lost lot of money in stock trading so much so that you know what. He needs my personal coaching to learn my course strategies. For that he is willing to spend Rs.28,000/-, but is not willing to pay the fees of the course. Strange. After taking the screen shot, I deleted the message. I did not reply, nor called him. 2. What is the truth behind the SMS? May be he is a crorepati who knows? 3. Giving a shot to emotionally blackmail to get the course for free. A few months back one person called me. He was crying and said he is retired, aged 65, and lost 80% of his retirement money trading stock markets and he needs my help. Read – he wanted the course for free. Well I have more than 10,000+ mobile numbers in my database and I can easily keep one marketing guy to call people to do my course. I NEVER do it and will NEVER do it. Did you ever got a call from me after filing the form in my site? No, you will never get a call from me ever. The email is taken to send you free emails that is all that too if you are interested and filled the form, and the phone number is taken to help you save money on brokerage, there is no other reason. Both are to help you. But everything is your choice. – And you can enroll for my paid course or not enroll – it’s your choice. In fact all of the above is your choice. Frankly at least 70% of my customers have done my course after 1 or more year of being my free subscriber and am sure after losing money trading, then thinking ok let me try to recover the lost money by doing this course. Most of them do my course as a “Last Chance” to recover lost money from stock markets. You should have reported that to the authorities. May be he has missed to inform that he is willing to pay, may be he would be coming from roadways bus or other cheaper means of traveling. May be he would be staying to some dharmshaala free of cost. May be he will really do what he is saying. The way you have calculated cost, its on higher side, but the words that guy is using can be alarming too. Yes I agree Paritosh. In fact he called me from a different number after this was posted and said the booking by train has already been done. I think a lie. Again he never mentioned the fees, in fact he said you give FREE training, so I am coming. 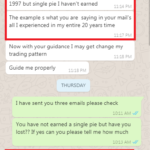 When I told him the strategies he is looking for is in the paid course, he said he is willing to pay my fees but only if I can teach him how to make Rs.7 Lakhs from 30k in Call Put option trading. I told him this is simply not possible, then he said but someone told him. I am sure that “someone” is a tip provider. I am sure when I told him the truth that only 3% a month is possible, he kept the phone down and must have paid to that tip provider. Sad but what can I do? As far as reporting to authorities is concerned, why should I get into all that hassles? My job is to educate, and I am doing my job. I do not have control over what others are doing or thinking. I tell the truth, it is up to my site visitors to believe or not. I cannot force them to believe. Yes … now I too agree with you…. at-least in this situation when someone is trying to emotionally blackmail. If you cannot trust on people, than how can you expect that people should trust on you. I know how market works and how people fail because of the agents in the market. If you are professional doesn’t mean that you can read people life by just reading there email. Every one really appreciate your thoughts towards market and we read your emails. But when we see this kind of emails from you, its really rude. My apologies Manoj if you think this is a bit rude post, but please also look at my situation. Reading such SMS as soon as you get your hands on your mobile early in the morning makes you a bit disappointed. Read the above comment from me. I agree your point that in this business it is very hard to believe anyone. 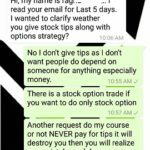 Too many tips providers are fooling people so traders have lost trust on anyone giving tips or course. But the post was just to tell people as a request to stop disturbing me. If they are not interested in my course its fine, its their choice. Sometimes I get overwhelmed reading such messages or getting phone calls. But I know even after this it will not stop. Again my apologies if the post hurt you in any way. Sir You have taken my comment seriously… just that is enough for me. Just connect with people.. money automatically will connect you.. that’s for sure. Sorry if have hurt you. Hope you are doing well.. I was going through this post & felt sad you had to deal with such kind of people too.. The world is full of money minded, greedy, cunning, selfish people so its pretty tough to take a call when people approach you with such issues/excuses.. Anyway, keep up the good job you are doing. I’m sure there are lots of people who are benefited with your service.